About six weeks ago I made the long overdue decision to cut out refined sugar and all wheat, swapping instead to natural fruit sugars in small amounts, and low carb alternatives to wheat, such as buckwheat, making use of coconut and almond flours to cook with at times. I’ve noticed I’m feeling substantially better since I made this decision, but there were a few things I was missing, one of which being small sweet treats I could nibble on on busy days, so after some research, I combined a few recipes I liked the look of to make the most of the ingredients I had in the cupboard. The resulting concoction turned out tasty enough to be worth sharing here! Nut, Coconut & Cacao Bites – Vegan, Raw Treats. Dates – approx 100g, soaked in water for 15 minutes, then the water discarded. 2 heaped tablespoons of melted coconut oil. Put the dates and nuts into a blender and give them a thorough whizz up until they are as finely chopped as you prefer. Add the raw cacao powder, dessicated coconut and melted coconut oil, and whizz up again thoroughly until it makes a thick paste. 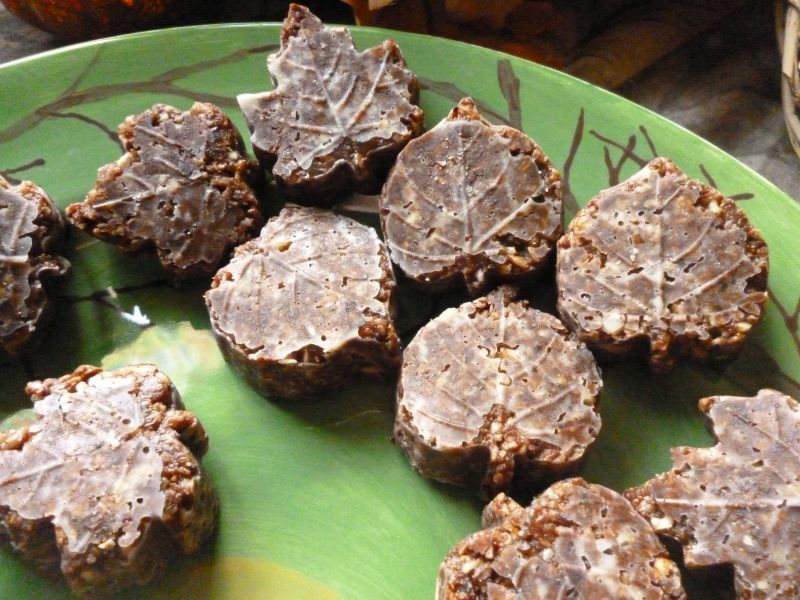 Using a teaspoon, scoop out small amounts and roll into a ball in the palm of your hand – I packed mine into silicone chocolate moulds in the shape of leaves, which worked beautifully! Put the tray in the fridge for 30 minutes to encourage the mixture to set firmly, or finish shaping the mix into balls and put those in the fridge. The setting coconut oil makes these set firmly, and they make delicious and nutritious energy balls for snacking on through a busy day! Yum! In my house, we call these “fat bombs”. Such a great recipe. I LOVE how you made them into leaf shapes. So pretty! I found the leaf mould in a shop down in Sussex recently – I think any pretty silicone chocolate mould would do the job just as well, but what can I say, leaf shapes – it had to be done!! I’ve reused this mould loads recently. Right now I have a bunch of raw chocolate coconut and bee pollen leaves in the fridge to nibble on – great energy boosts!